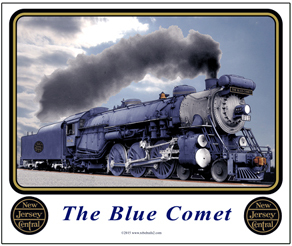 The Central Railroad of New Jersey ran the famous Blue Comet fast passenger trains. 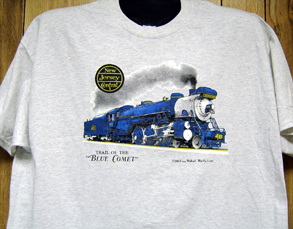 Presenting the beautiful Central of Jersey Railroads "Blue Comet" t-shirt on a light grey / ash premium tee. The Blue Comet was the flagship passenger train on the Jersey Central Lines. 6 inch x 6 inch square tin Blue Comet logo sign of the Central of Jersey Railroad. Jersey Central Coffee Mug featuring a unique double ended diesel built by the Baldwin Locomotive Works just for JC. Coffee Mug featuring the newest JERSEY CENTRAL widebody diesel in the Norfolk Southern Railroads Heritage Fleet. 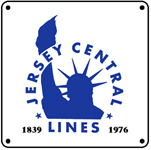 The Jersey Central Lines famous Trail of the Blue Comet ad, featuring their logo, steam locomotive and wording. The Jersey Central Lines famous Lady Liberty logo in blue. The Jersey Central Lines circle logo in black and gold. Used on the tender of the famous Blue Comet steam locomotive. 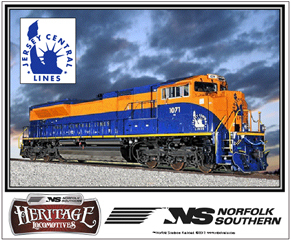 Jersey Central diesel joins Norfolk Southern Railroads Historic diesel fleet. 6 inch x 6 inch square tin sign of the historic Jersey Central Heritage diesel. A powerful locomotive paint scheme. 6 inch x 6 inch square tin Statue of Liberty logo sign of the Jersey Central Railroad. 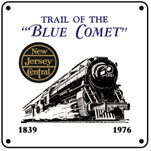 Jersey Central Lines operated the fast and famous Blue Comet Passenger Train with colorful steam locomotive that burned the rails throughout the middle Northeast. Mouse pad honoring the new Jersey Central Heritage diesel operated by the Norfolk Southern Railroad.